Your content marketing only works when your audience responds to it. That’s a “no-duh” statement – we all know that. 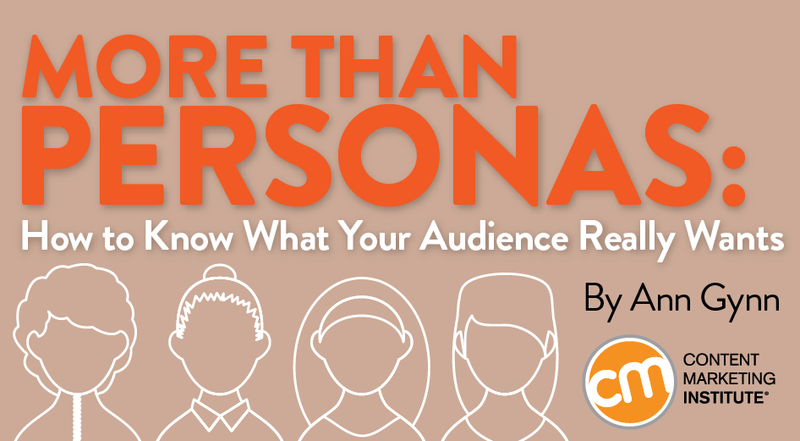 So beyond buyer personas, how can you really, really understand what your audience wants and how you can help them? We asked the presenters for Content Marketing World 2015 and some friends of CMI to share how they truly focus on their audiences (besides creating personas). Almost all their answers fall into a few broad categories – connect in real life, monitor social, and dig deeper with data. Read on for some of their insightful comments to help tune into your audience with razor-like precision. Get out of your office and make sure your marketing team is always meeting with customers. Marketing managers should set aggressive, quarterly goals for meaningful customer discussions (standing in a trade show booth doesn’t count). Just like you may have targets for content production and marketing qualified leads, make sure you have targets for customer engagement. I’m actually not a big fan of personas. But, I do love spending a lot of time with real customers, hearing their frustrations, talking to them about the industry and its challenges, seeing what speakers are talking about on stages, watching the blogosphere and social media to see what’s resonating and being discussed, and generally being part of our customers’ world. I also love doing the work myself – being my own customer and feeling the same pain our customers feel. Those experiences give me a much better sense of the field than a persona. Two words: Ask them! We’re always asking our customers what we’re doing well, and what we can do to improve. We engage with our prospects via online chat, outbound calling efforts, and targeted campaigns to understand the challenges they are facing, and how our software can help. We keep track of these insights in tools like Marketo and Salesforce – and share the information via Chatter and internal wikis so everyone in the company is updated and informed. Messaging segmented by responsibility and role (personas) reminds me of a behavioral science term, fundamental attribution error. This is a calculation in which humans overestimate the effect of a person’s disposition on their behaviors, good or bad, while underestimating the influence of situational factors. Think about when someone cuts you off on the freeway. You might immediately assume the person did so because he or she is a jerk. But a host of situational factors could be behind the hazardous driving, right? In all likelihood, the situation is dictating the behavior, not the disposition. With persona-based messaging, you’re maintaining that role and responsibility matter more than the pain stemming from the status-quo situation. To truly get decision-makers to rally around the prospect of change, your messaging should take aim at the situational factors that, if left unresolved, threaten a company’s most important business goals. It’s a simple litmus test: Would I read/watch this? If the answer is “no,” then I know some serious aspect of it is out of alignment with the audience. I’m a big fan of social listening. Get as close as possible to what your audience is doing behaviorally and learn from it. The internet is a gigantic ethnography. It’s our job to pay attention. Learn from your metrics. Don’t just glance at your open and click-through rates, figure out the click-to-view ratio for each article in your newsletter or offer in your promotional campaign. Of those who opened, how many of them clicked on article A? Article B? What if you sent the same or a similar topic to those who clicked on article A? Were they more likely to click through on the matched topic or on another topic in your next email? Dig in almost at the individual level to find out what your subscribers want from you. And don’t forget to watch the negative metrics, too. A bump in unsubscribe rates could mean that you’re off track, either with too much frequency or not enough value (relevance). I think most marketers have it backwards with personas. Businesses need to understand their consumer. But starting with some profile can limit the perspective of what the audience is interested in. My suggestion is to start with what keywords people use to search for solutions, what questions they are asking, what content they are sharing, what sites they use as sources of information, and which influencers they listen to. THEN, filter those insights past your personas to see if there is a fit. Make calls with your sales reps. Not only will you find out what is really important to your audience, but you’ll also better understand what the sales person goes through and what materials work and don’t work. It is really (really) that simple! Find a way to actually talk to customers whenever, wherever, and however you can. Call them. Buy them coffee. Go on ride-alongs with the sales team. Take customer service calls. Understanding your customer isn’t hard, it’s just that most marketers either don’t want to put in the effort or don’t feel empowered to actually interact with customers in the real world. Create a regular survey with your audience using a tool such as SurveyMonkey. Assess the common issues that keep appearing on your survey. Split-test different options on your website to see what resonates with your audience. Monitor your analytics. What content gets the most shares, the most visits, the most subscribers? You should be producing more of the content that is working for you. Map and understand your customer’s buying or engagement journey. Customer journeys allow you to prioritize your content investment by not only figuring out what your audience wants, but also what they need to get them closer to a buying decision. By honing in on your audiences’ initial point of potential need or inquiry, and their moments of research and validation to the end point of a buying decision, you can begin to understand what content to focus on. Combine this journey with your audience’s functional, rational, and emotional needs along that journey, layer in content consumption preferences in terms of types and channels, and you’ll understand the why and the when needed to make content truly work as a strategic asset. Put down the persona doc, go out and meet your prospects in person. Frequently. Buy them a frappuccino. Pick their brains. Soak up the way they describe their world. Be the audience – empathize and put yourself in the shoes of that audience. Talk to them and gain first-hand perspective in what they’re experiencing every day. Determine your topics of expertise, then do keyword research to pick the right words. You need to listen to them. I know that it sounds like marketing 101, but you’d be surprised at how many companies don’t realize how open their customers really are. People today are much more willing to give helpful feedback to brands and marketers. When you reach out to them to initiate a conversation, that act alone is the first step in establishing a relationship that will make them feel like their opinions matter. This can be done through surveys, focus groups, or just phone interviews. In addition to a direct approach, you also have to listen to what sales [people] are saying. I just completed an extensive listening tour with our sales team and this helps me determine key sales blockers and trends. This information is going to dictate our content marketing strategy for the rest of the year. What are the questions people are searching for that would land them on my website? What are the questions people are searching for that I’m not even answering? Your next step is to research keyword phrases and questions to see their search volume and competitiveness. You may find gaps that are ready to be filled, so come up with dozens of topic ideas and create content around them. This way, you are becoming the answer they can land on. Go watch your target audiences in their native environments. Spend time talking to them. When I started as a hospital content writer, I would hang out in the waiting rooms and ask patients questions about what types of content they would like to see on the website. Even now, I set aside time every month to talk to clients to understand where the marketplace is going. If you don’t keep in touch with your target audience, you’re shouting at everyone, which means you’re shouting at no one. A subscribed audience is one of the five core elements for running successful, scalable content marketing operations. Read our 2016 Content Marketing Framework: 5 Building Blocks for Profitable, Scalable Operations for an overview of the full strategic blueprint.